YOGA is a self reliant healing system who’s origins date back to 3000 B.C. For centuries it was passed along the ancient Indian Brahmans and Sages orally and by practice alone. At that time, it was suitable only for those of the purist intentions and livelihoods. Finally, some time between 500 and 200 B.C. a man by the name of Patanjali wrote down the infamous Yoga Sutras and encrypted a path for the world to follow. Today, yoga is synonyms with health. Yoga studios are popping up on every corner of the world and accessible to every body. For today’s purposes, we are focusing on Yoga and its affects on the heart. Only in the last 20 years has western medicine and science put yoga to the test. The results are profound benefiting people afflicted with every form of disease and discomfort as well as people in good health. For those of us that practice regularly, there is an inherent knowledge and tuning in of our own bodies, minds and hearts. For those who experience yoga for the first time, in most cases it won’t be the last. Yoga makes you feel really good! At the Anjali Yoga Studio, we are committed to providing a traditional yoga experience to our students. Following the practices of Pranayama (breathing exercises), Asana’s (physical postures), Meditation (realizing your true essence or soul) and Philosophy. Through these practices it is said that ultimate health is attained mentally, physically and spiritually. 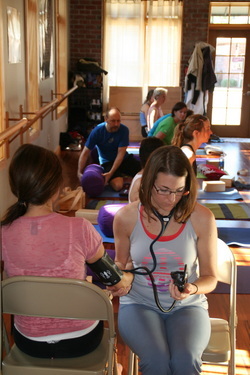 Last Sunday, February 6th, 2011 we held a special workshop and put yoga, science and the heart to the test. Cardiothoracic surgeon at First Health and fellow yogi Dr. Peter Ellman attended as our heart expert. Sarah Ellman, a former pediatric oncology nurse and Dr. Jessica Patella a Naturopathic Physician, and myself, Marie Thorne-Thomsen, owner and teacher at the studio, assisted with the testing, statistics and analysis. We had 18 participants. We took blood pressures and heart rates before and after class. Within our study we had 5 people that came in as Hypertensive (BP over 120/80). Those statistics align with the US average that 1 in 4 people have high blood pressure. After ONE class, those five participants received an average 11 point drop in the Systolic and 10 point drop in the Diastolic readings, bringing them well below their Hypertensive state prior to class. The people with normal blood pressure readings had small variances. Those in optimal health actually had slight increases in the blood pressure readings but low drops in heart rate. Others had drops in their blood pressure and heart rate. A study published in the British medical journal The Lancet performed by Dr. Chandra Patel, 40 subjects received yoga intervention for 3 months. They averaged an astounding 26-point drop in Systolic blood pressure and a 15-point drop in Diastolic blood pressure. After a 1 year follow up with the same subjects they found an average 20 point drop in Systolic blood pressure and 14 points from the Diastolic blood pressure readings. WOW!!! A small randomized controlled study, published in the year 2000 in the Indian Journal of Physiology and Pharmacology, compared the effects of yoga, drug therapy, and no treatment among 33 patients with hypertension. The yoga intervention consisted of Savasana (corps pose – see picture), more active poses, Pranayama (breathing exercises), and Meditation done one hour per day. After eleven weeks the BP among the 11 patients in the yoga group dropped from an average of 156/109 to 123/82. The eleven patients treated with drugs saw their pressure drop from 159/106 to 135/97. The control group with no drug or yoga therapy went from 155/109 to 151/107, a statistically insignificant change. The yoga group also lost an average of 16 pounds. Heart Disease is the #1 killer of both men and women in the United States. The #1 KILLER! As I personally am approaching 40 years old with a family history of heart disease, heart attacks and hypertension, as well as the Big C, I find this information food for my heart and soul. Not only is yoga good for the heart but it conditions every system in the body and carries with it a real sense of peace, love and community. Every professional athlete incorporates yoga into their training programs not just for flexibility but for the transformational effects on the mind. As master teacher B.K.S Iyengar aptly quotes “Words fail to convey the total value of yoga. It has to be experienced.” Clearly, the effects of yoga on the heart are dramatic and persuasive. If you have high blood pressure, a regular yoga practice will bring it down and keep it down as well as promoting overall good health and fitness. So there you go. I could write forever about my personal experiences as a student for the last 22 years and as a teacher for the last year here in Southern Pines at the Anjali Yoga Studio, but I’ll save it for class and the weekly sports section. Locally, you may have noticed a little yoga boom. Kind of like a Starbucks effect in our own Moore county. Not only do we have the beautiful Anjali Yoga Studio where we offer over 30 classes a week for the young and old, the weak and strong and the endless searcher of the soul, there is also Hot Asana, a hot yoga studio recently opened by local yogi Virginia Gallagher and Hot and Healthy in Pinehurst. Lastly but not least, our own Naturopathic Physician and Kundalini Yogi, Dr Jessica Patella, will be offering a Wellness Workshop on Hypertension Saturday, February 19th from 1-3. In this workshop you will take away a toolbox of holistic options that have been shown to reduce blood pressure. You will learn how to implement common foods, supplements and lifestyle modifications into your daily life. This workshop is for both people that want to stay off blood pressure medications, as well as, people that are already taking medication. We will finish the workshop with light yoga and breath work so you can begin experiencing a holistic approach right away. Dr. Patella will be available to take blood pressures before and after the workshop. As we say in yoga after every class or gathering Namaste’ (the light in me sees the light in you). If you are interested in trying yoga at The Anjali Yoga Studio please go to our website www.anjalistudio.com sign up online. We will look forward to seeing you in class.